Bowel segments have been used for reconstruction of the bladder since the turn of the century (von Mikulicz 1899). 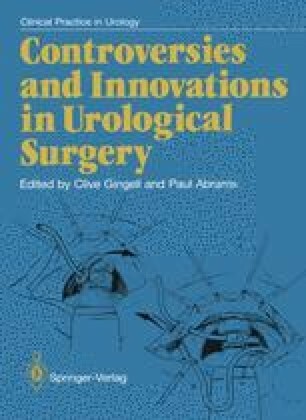 Subsequently various authors reported the use of ileum and colon for bladder augmentation. The early results were generally disappointing, partly because most of the procedures were performed for the contracted tuberculous bladder prior to the introduction of successful antituberculous therapy and partly because intact bowel segments anastomosed to the opened dome of the bladder, the “bull-horn” cystoplasty, tended to act as a diverticulum, especially where relative outflow obstruction existed because of reduced voiding efficiency.